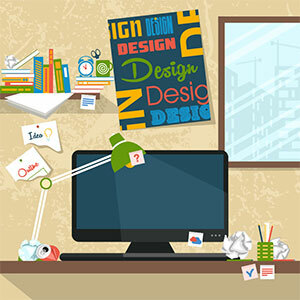 Web design incorporates a bunch of different factors. When combined, these small, but vital elements come together to make a website. Though many of us use the Internet each day, some people don’t quite understand what actually goes into those websites to make them what they are. These elements include layout, color scheme, graphics, fonts, and most importantly, content. First and foremost, we come to the layout of a website. If you’re asking yourself what a layout is, let me explain. Layout determines the aesthetics of a website (i.e., how it will appear to the viewers, and how visually appealing it will be), and is quite possibly the most important factor when considering web design. Think about it for a moment. Would you want to visit a cluttered and unprofessional website? Me neither! Layout should be user-friendly, easy to access, and easy on the eyes. One element that should correlate with your layout is the color scheme. It should target your audience, and overall, make the experience much for appealing. The color scheme is something that will really grab the attention of your viewers. It should coincide with the general theme of your website, and if you are looking to hire a professional website designer, chances are, if you’ve picked the right one, they’ll be able to point you into the right direction. That being said, once the layout and color scheme have been considered, planned, and then put into actions, a concern rises for graphics. Time and time again, I’ve heard clients complaining because they don’t feel that their graphics are suitable for the website, or sometimes, they can’t think of an idea for a graphic at all. Both of these scenarios are obviously problematic. Graphics. One simple word, but a fascinating and quite complex thing to think about. Have you ever heard of Photoshop? It’s powered by Adobe, and is the world’s most popular graphic design program (whether it be for standard photo manipulation, logo design, video construction, or the like). Most of the designs that you’ve come across on websites have been produced in Photoshop. It takes a lot of work, mastery, and raw talent to be able to produce quality material, but once you’ve got it, it’s there; and creativity will take you everywhere. The type of fonts you use are important to your website, as well. Fonts are probably the most visually appealing thing that you will encounter on a website. Not too big, but not too small, a style that is just right. Fonts that directly correlate with the general theme of the website are the best. There should be no need for your viewers to squint at their computer screens or mobile devices. Do your website, and your guests a favor, and put some real consideration into this element. It’ll save you a lot of editing time, and a slew of frustration. Content, content, content. Depending on your target audience, and what you are trying to accomplish with your published website, this is entirely dependent upon you. However, whatever the case may be, make sure you’re distributing quality content, and factual information (unless it’s purely opinionated, then that’s a different story entirely). Website designs need to be user-friendly in nature. There should be simple navigation, relevant multimedia, compatibility, technology, an interactive interface with the user, and most of all, professionalism.